This isn’t a new project, but just one I was using and enjoying. 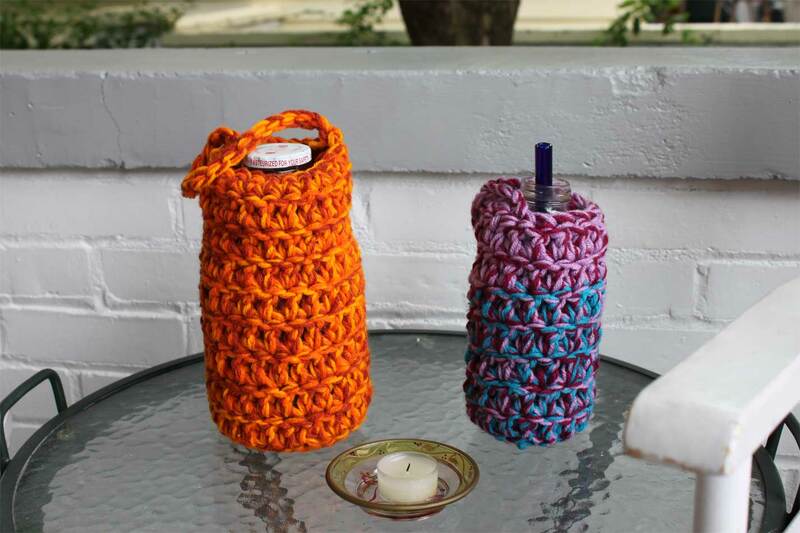 Last summer I crocheted cozies for the repurposed glass juice jars we use for water. I put little handles on them and they are very cute and portable, and they both insulate the jar and keep it from getting broken if I want to grab one on the go. It felt like a nice way to use up (gifted) scratchy acrylic yarn I wouldn’t want to wear or put on my babies. I just crocheted a little mat the size of the bottom of the bottles, then did double crochets in a round all the way up the side. I used several stands of yarn together so it would be extra bulky.